HB157 decouples Maintenance of Certification (MOC), a product sold by American Board of Medical Specialties, from hospital employment privileges and insurance panels. Currently, MOC may be used by hospitals and other healthcare entities to deny a physician hospital staff or admitting privileges solely because the physician refused to participate in maintenance of certification. The Virginia board of Medicine specifies that the medical licensing statute does not require a licensed physician to hold or maintain a board certification in a specialty medical area. Although HB157 didn't make it out of committee during this 2018 session, we need to continue collecting signatures from practicing physicians to help legislators not to succumb to fear and pressures from entrenched organizations that are profiting from MOC in Virginia. The Medical Society of Northern Virginia and it's more than 1,600 members are in full support of removing MOC as a requirement for hospital staff privileges and insurance plan participation. Although HB157 didn't make it out of committee during this 2018 session, we need to continue collecting signatures to prepare for the 2019 session. Please help us collect as many signatures as possible to demonstrate a stronger front and a unified physician block for next year. All signatures collected on this petition page will be forwarded to members of the Virginia General Assembly. 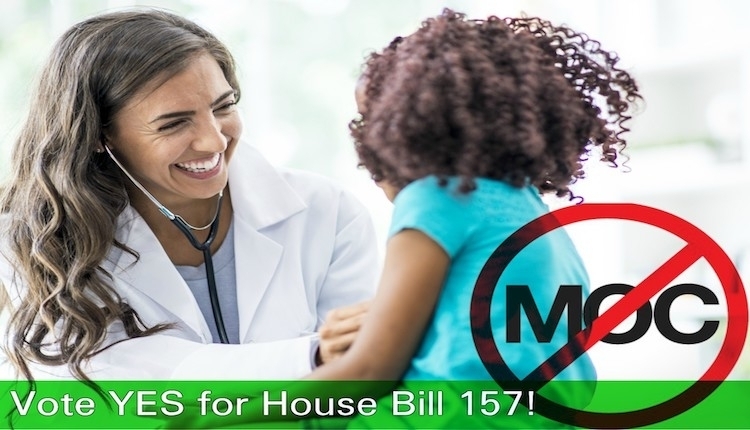 The Vote Yes for HB157 - NO MOC NOW petition to Virginia General Assembly was written by Medical Society of Northern Virginia and is in the category Health at GoPetition.